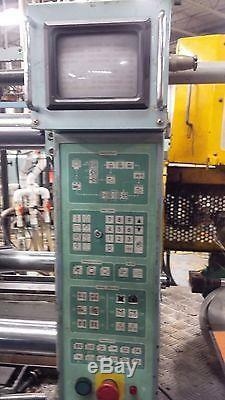 WELLTEC 181-TON PLASTIC INJECTION MOLDING MACHINE , MODEL TTI-165F, 15.2 OZ (431 GRAMS), MAN. IN 2001, 18" x 16.14" (457 MM x 410 MM) TIE-BAR SPACING, 28.125"H x 25.188"V (714 MM x 640 MM) PLATENS, 34.06 (865 MM) MAX. DAYLIGHT, DIMS: 198"L x 41.5"W x 65H, APPROXIMATE WEIGHT: 11,900 LBS. INJECTION MOTOR/PUMP REQUIRES NEW SEALS, OPTIONS INCLUDE CORE PULL. The item "2001 WELLTEC 181-TON PLASTIC INJECTION MOLDING MACHINE #1" is in sale since Wednesday, August 30, 2017. This item is in the category "Business & Industrial\CNC, Metalworking & Manufacturing\Process Engineering Equipment\Plastics Equipment & Supplies\Injection & Blow Molding". The seller is "frankcutronijr" and is located in Pompano Beach, Florida.